Bujar Nishani (Democratic Party, PDSH) was elected President of the Republic of Albania on 11th June. He won 73 of the 76 votes cast at the Assembly of the Republic, the only chamber of Parliament, in a 4th round election in which only an absolute majority was required. The Assembly comprises 140 MPs but the members of the Socialist Party (PSSH), present in the hemicycle refused to take part in the election. Just before the 4th round, Artan Hojda, former Economy Minister (1992-1993), withdrew from the race without saying why. The election of the President of the Republic highlighted deep divisions amongst the Albanian political classes. Since the general elections on 28th June 2009, won by the Democratic Party and deemed fair and honest by all international organisations, the socialist opposition has been refusing, in spite of mediation on the part of the European Parliament, to acknowledge the victory of the majority coalition. In 2011 it organised violent demonstrations against Prime Minister Sali Berisha, (PDSH). In May 2011 it challenged the election of the Luzim Basha (PDSH) as Mayor of Tirana, who beat the historic PS leader Edi Rama who had been mayor for three terms already. On this occasion the socialists took up their boycott of Parliament again which MEPs had previously succeeded in lifting. The opposition has literally taken Albania's progress towards EU membership hostage. 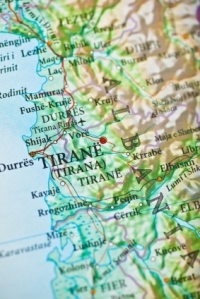 The fair election of a president, who is able to embody the country's unity, was one of the conditions set by Brussels on Tirana for its bid for EU membership to move forwards. "The choice of the President of the Republic must respect the spirit of the Constitution which stipulates that he has to be someone who represents the unity of the Albanian people," said the European Commissioner for Enlargement, Stefan Füle, on 3rd May last. Brussels has already delayed granting Albania its official EU candidate status twice (the country applied for the first time in 2009). Ettore Equi, the head of the EU's delegation in Tirana congratulated Bujar Nishani on his election as Head of State. "The role of the President of the Republic in the consolidation of the independence of the Albanian institutions and in the unification of the country's efforts is of the highest importance so that Albania can move forwards along the path to EU membership." The Albanian president is elected by secret ballot for a 5 year term in office by the 140 members of Parliament. His mandate is only renewable once. The head of State's powers are honorary, but he is responsible for the respect of the Constitution, he commands the armed forces, appoints and dismisses some of the high ranking civil servants and embodies the unity of the Albanian nation. Five rounds of voting are planned for in the Constitution for the election of the President of the Republic. To be appointed in the first three rounds a candidate has to win at least 3/5th of the votes of the members of Parliament, i.e. 84 votes (article 87-3 of the Fundamental Law). If this fails a 4th round, and then possibly a 5th, takes place in which only the absolute majority of the vote i.e. 71 votes, is necessary. If after these five rounds no candidate has been elected the Assembly of the Republic is dissolved and new general elections are organised within the 60 days that follow. The new Parliament elected after this then has to elect the new Head of State by an absolute majority of its members. Anyone standing for election as President must be put forward by a parliamentary group comprising at least 20 MPs. The first round of voting took place on 30th May last. The PS rejected Xhezair Zaganjori, former ambassador and at present a judge at the Constitutional Court, who had been put forward by the Democratic Party; the PS accused the party in power of not conferring with it in choosing a consensus candidate. No voting took place in the first round. On 4th June the same situation occurred. However the opposition did not put forward any other candidate maintaining its refusal to cooperate with the democratic institutions. In the third round of voting on 8th June, MPs did not vote, since no-one offered to stand. Xhezair Zaganjori then stepped down as candidate. "My aim was to be elected with a consensus of the majority and the opposition. I will not stand in the fourth round of voting since the opposition does not trust me and I do not want to be elected with just the votes of the majority," he declared. Aged 45 and from Durrës, the country's main port, Bujar Nishani is a graduate of the Military Academy of Skanderbeg and holds a Masters in Law from the University of Tirana. He joined the Democratic Party in 1991, after the end of communism (1991) and at first worked at the Defence Ministry (as the head of external relations) he then worked for Foreign Affairs (director of the NATO Relations office). In 1997, after the PDSH's defeat in the general elections of 29th June he became the chairman of an NGO for the Euro-Atlantic alliance. Elected MP in 2005 he was appointed Home Affairs Minister in 2007. Re-elected to the Assembly of the Republic in 2009 he was then appointed Minister of Justice before integrating the Home Affairs Ministry two years later. On 11th June, Bujar Nishani, who made no declaration after his election as head of State, therefore became Head of State and the 6th President of the Republic of Albania since the end of communism. The present president of the Republic, Bamir Topi, will leave office on 24th July next. He announced that he would create a new political party.